I logged on, as expected, to a deserted meetup site. I took the time to take a few extra photos. The parent body 2 d was low on the horizon. 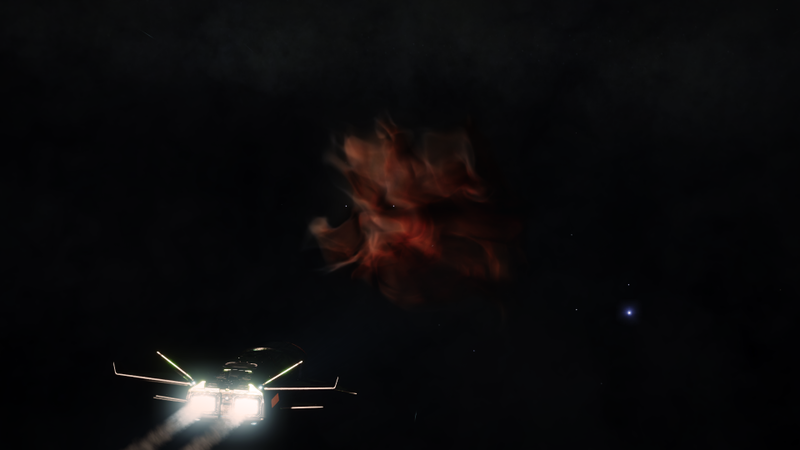 The Morphenniel Nebula was huge overhead - I needed a portrait orientation to fit it in. The nearby Bark Mounds had been stripped of any materials. All that was left to do was plan the next stage of my journey. It's a big two weeks of travelling to the next waypoint. 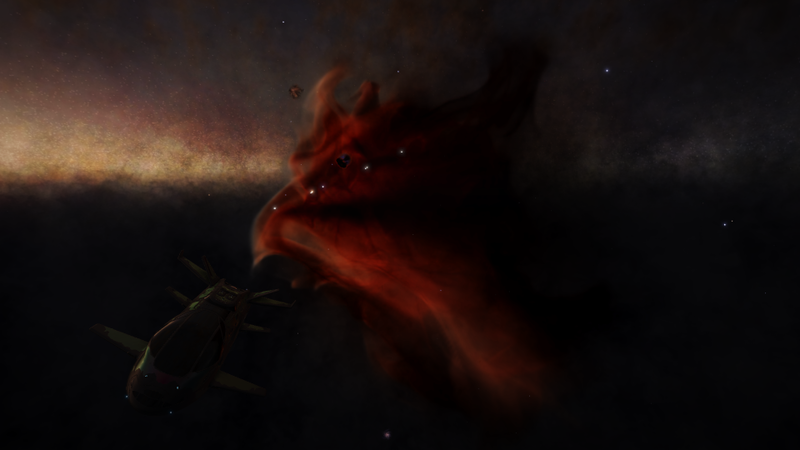 I'll be heading to the Phoenix Nebula first, then Poseidon's Fury, and then Aristo. That should keep me occupied for the next few days. 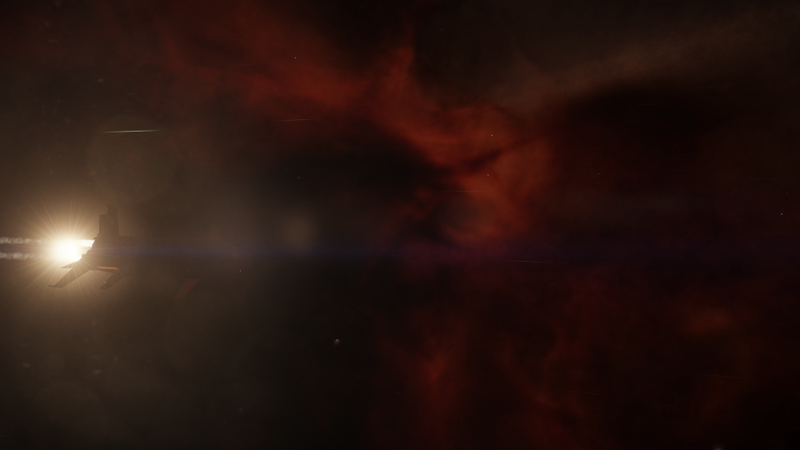 First stop was the Magnus Nebula. 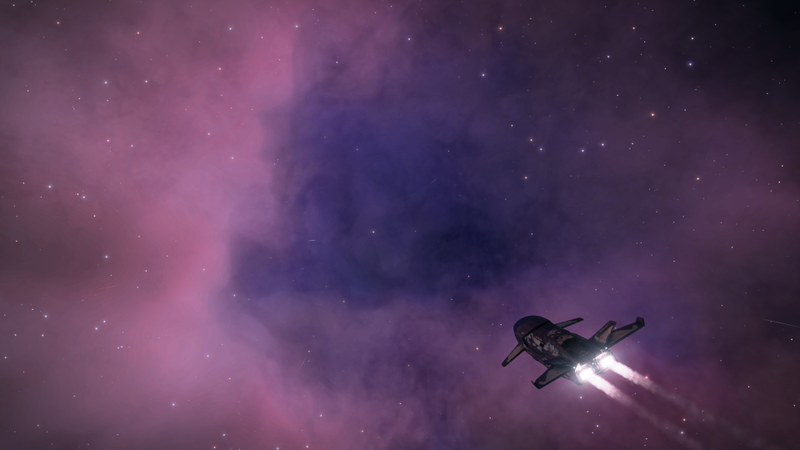 This nebula snuck up on me - I was expecting something smaller and when I was still a couple of jumps away I didn't realise I was already in it! 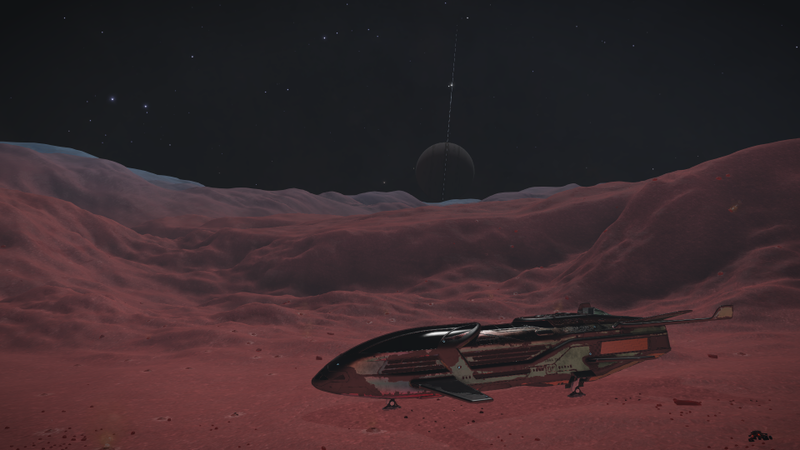 The best place to get a picture of it is at least 50Ly away. 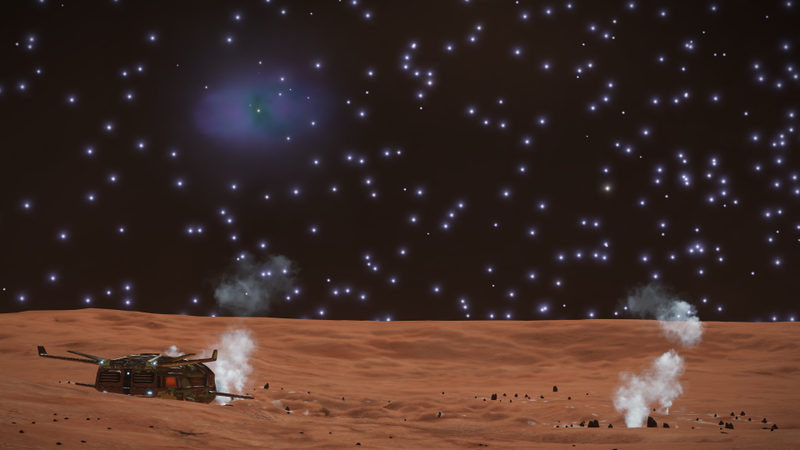 The picture below is at about 100Ly. 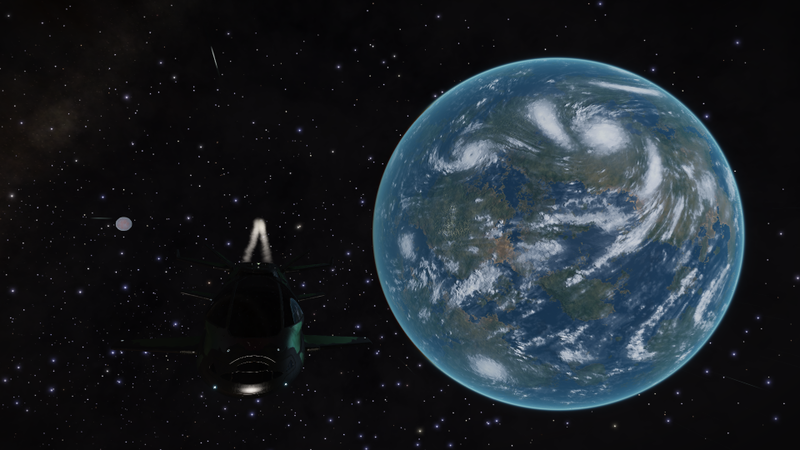 The next POI was Infinite Bonds, a pair of co-orbiting Earth-Like worlds. The next challenge was to get to Neighbouring Necklaces. 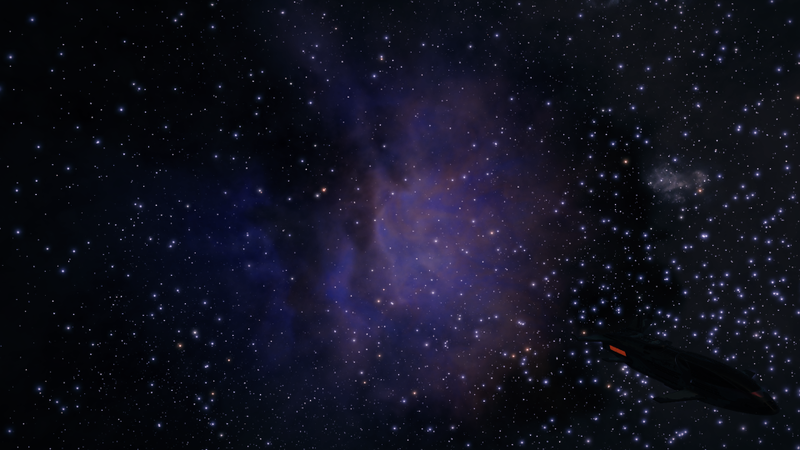 The permit restricted sectors Bleia3 and Bleia5 were blocking the direct path, so I started off finding a point 'south' of them (towards the galactic core) as an in-between point to aim for, then a second, before the route plotter would find a path. I got there eventually. I was a bit careless landing and knocked over 50% off my shields - that's what they're there for! Second last POI before WP10 was the Eos Nebula. 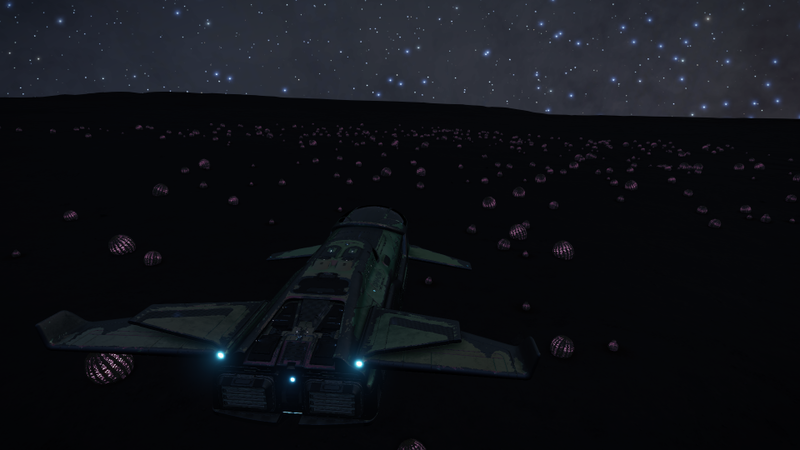 Somewhere on the way I passed 1,000,000Ly travelled in the game. 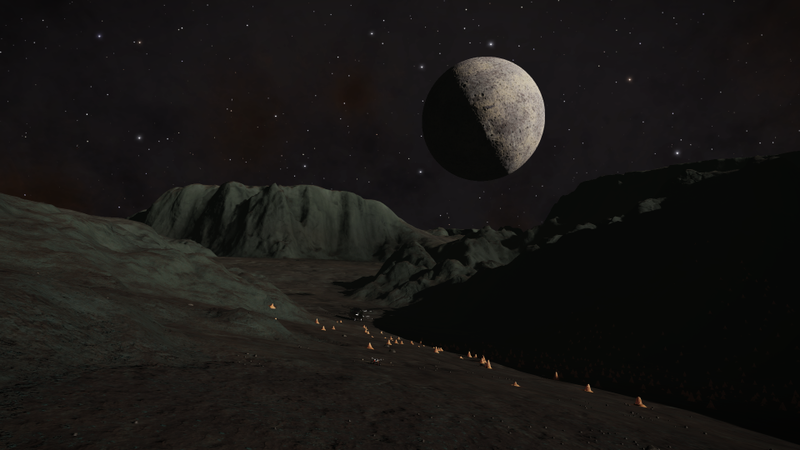 In that system I found a Luteolum Lagrange Storm Cloud with Solid Mineral Spheres and Rubeum Metallic Crystals. 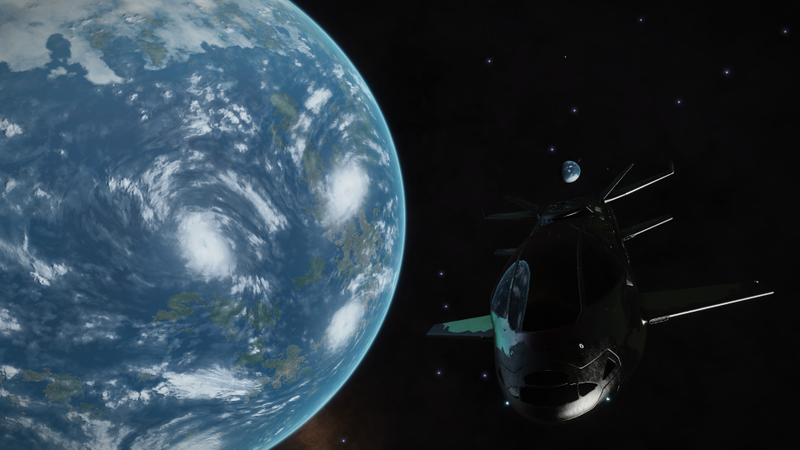 It's been a few days since my last untagged ELW, but I found one! 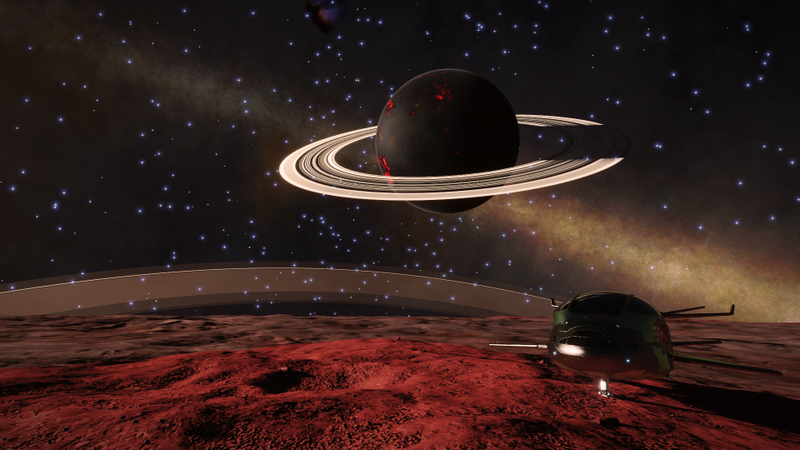 This one was co-orbiting with a High Metal Content world. 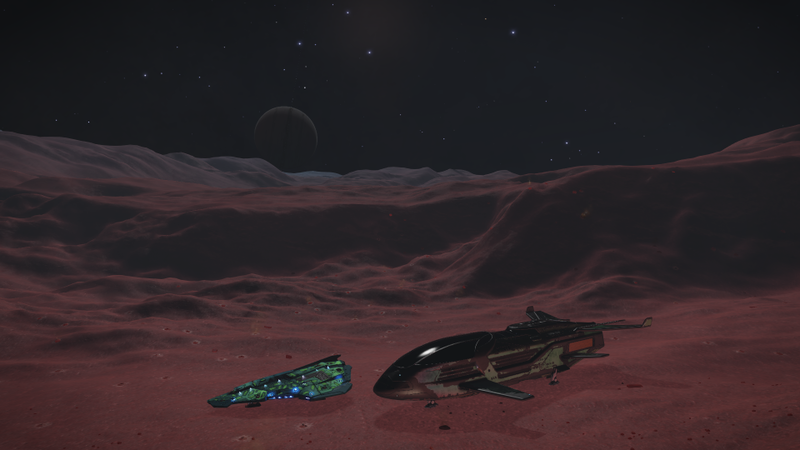 I finally arrived at WP10, the Morphenniel Nebula, and I finally found some other Cmdrs to talk to! I don't think I've seen anyone since WP3. I also got my first customer for a hull repair limpet. 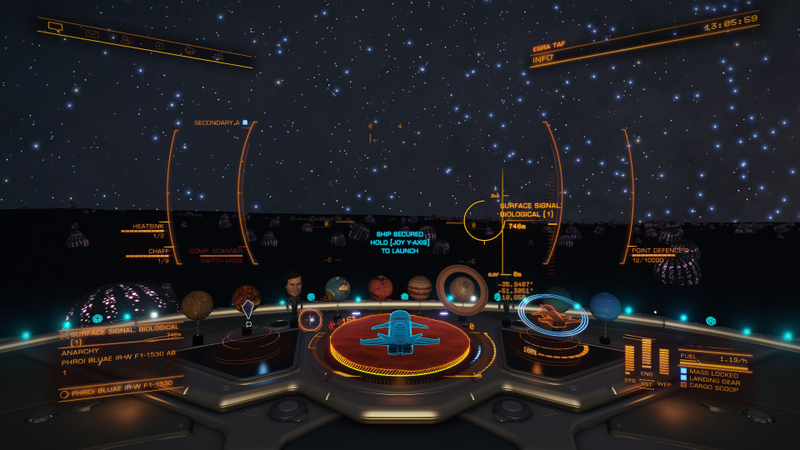 Congratulations to Cmdr Green Arkleseizure for being my first (and hopefully happy) customer. Day 82 was a very short play session, just a few jumps really. 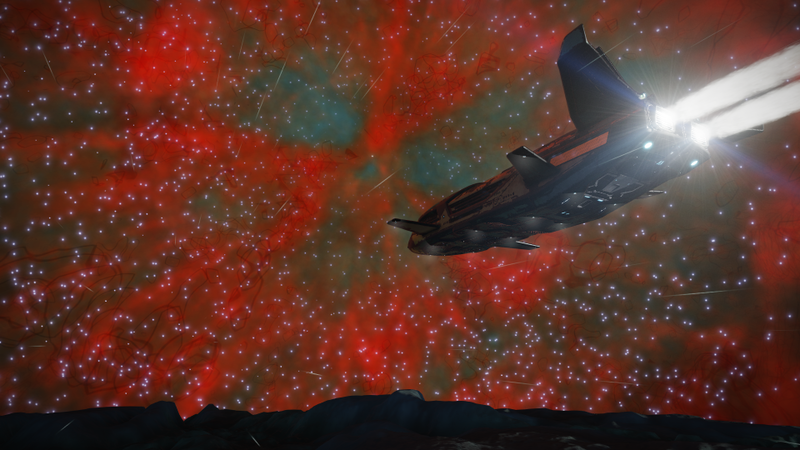 Day 83 I arrived at The Briar Patch Nebula. 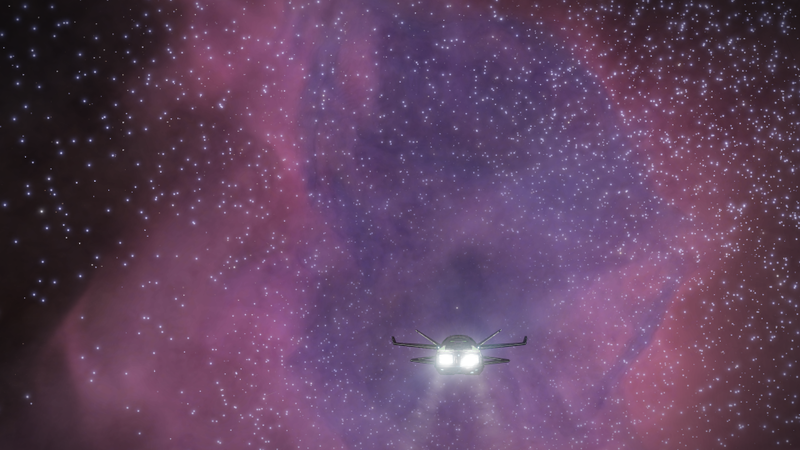 It's just a single neutron star, so not too exciting for a photo, so I poked around nearby system for something better. 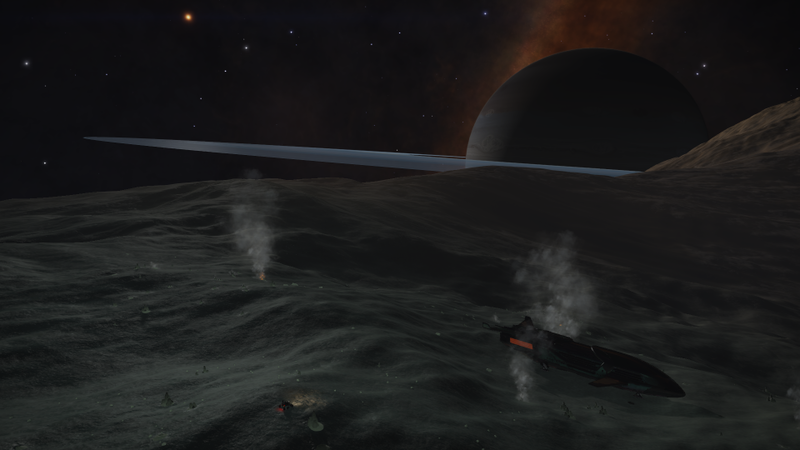 I eventually ended up at some Suplhur Dioxide Fumaroles at Geological 3 on Hypuae Briae CQ-X d1-1263 A 2. Next stop was The Zinnia Haze. Last thing for the evening was the leg out to the Hydrangea Nebula. 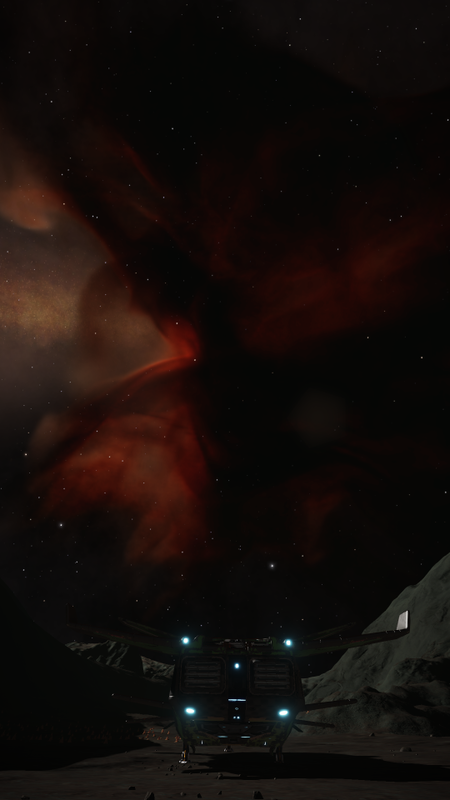 It's one of the pretty red/green nebulas. 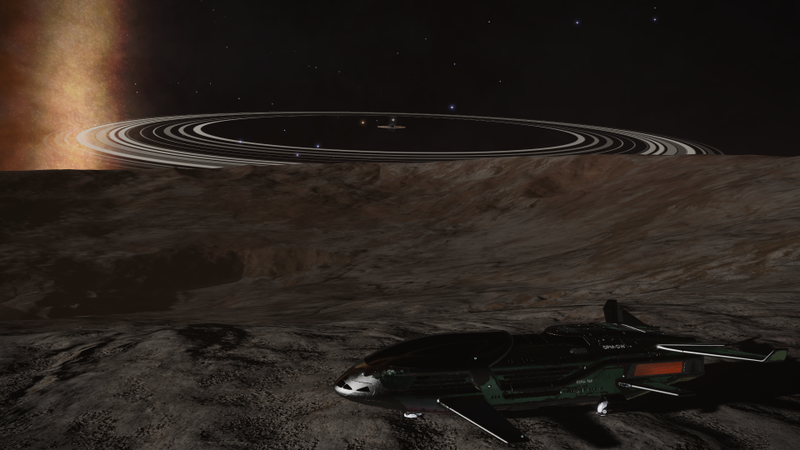 Well, I managed to stuff up my visit to the Biological POI on the 10.66G Phroi Bluae IR-W f1-1530 AB 1. 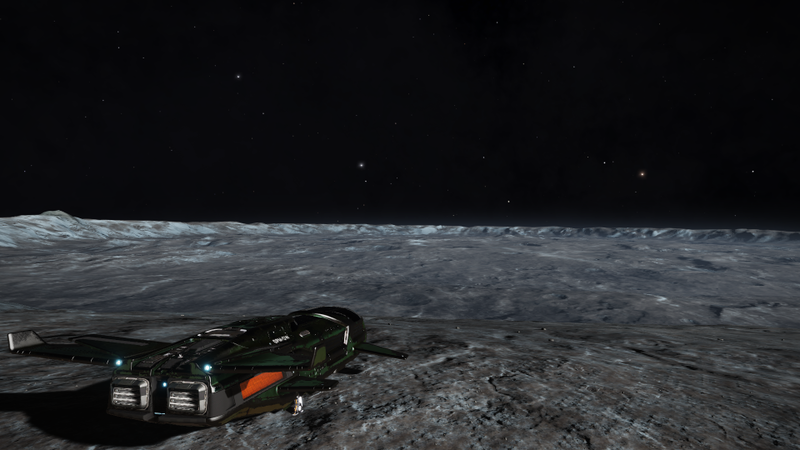 I first landed, carefully of course, with just a small boop that dropped my shields to 87%. I used the camera to look around, and grabbed a photo of the glowing Prasinum Bioluminescent Anemones. And then I left. 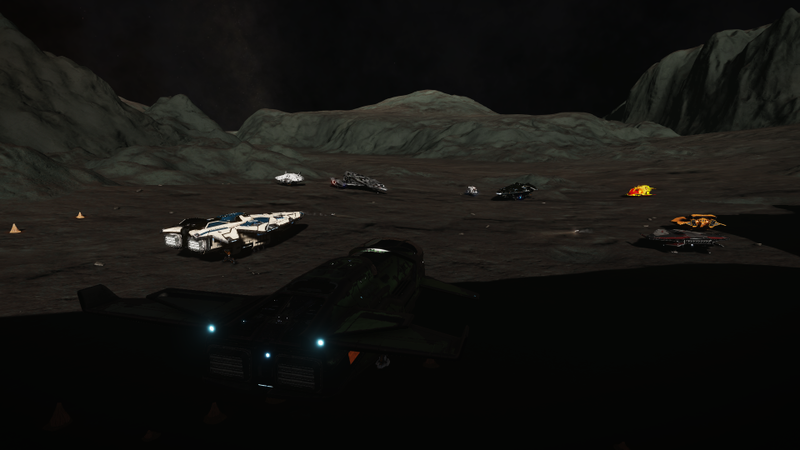 As soon as I hit supercruise I realised my stuff-up - I'd forgotten to scan the site! So I simply had to turn around and do it all again. 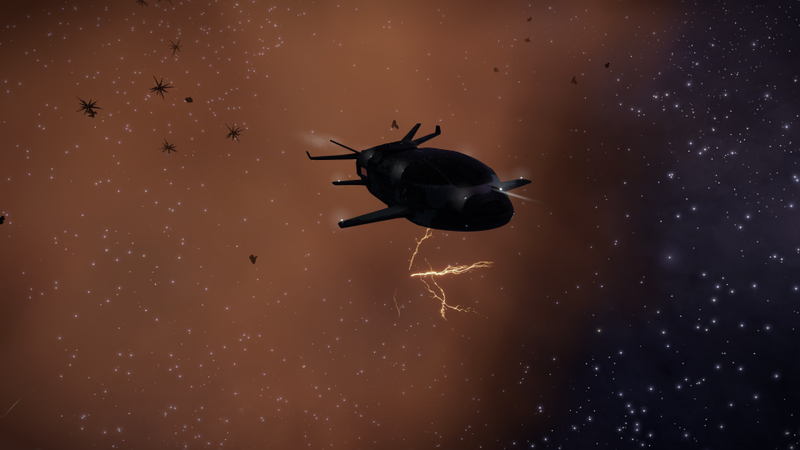 This time I landed without dropping the shields even 1%. 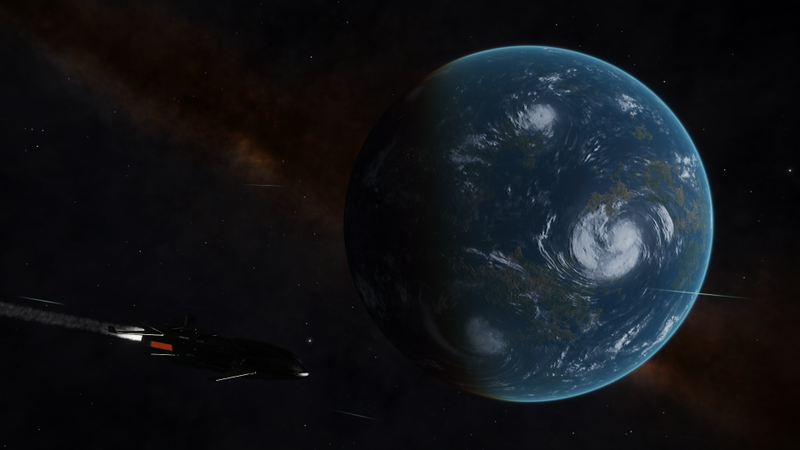 I stopped for the night at Undine Haven, a neutron star system where one of the stars has six Water Worlds and an HMC all terraformable! 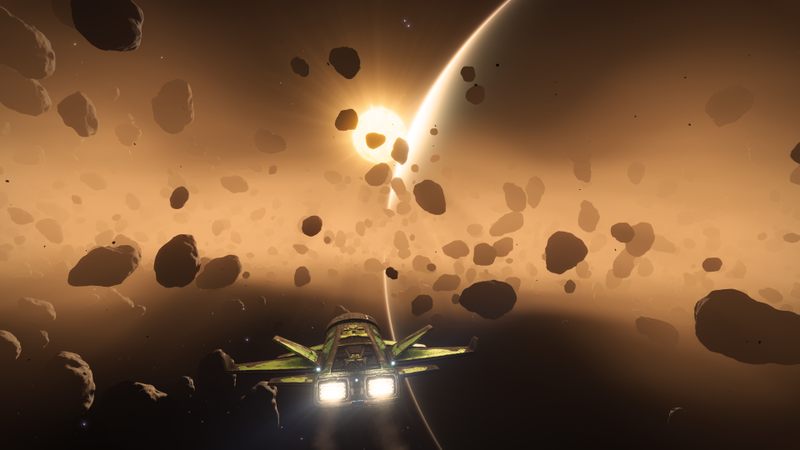 High-gravity worlds can be scary if you're not sure how to fly there. Any ship can land on a high-G world. 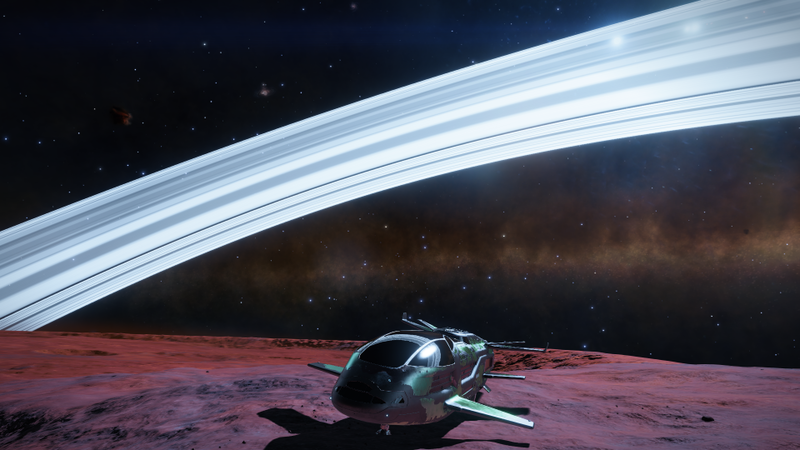 All thrusters are magically capable of handling any G. My Beluga is configured with the usual explorer technique of using the smallest D-class thrusters that will fit, 6D in my case. The landing technique is simple, but do a trial run on a low-G world first! Configure a button for Flight Assist in Hold mode NOT Toggle. 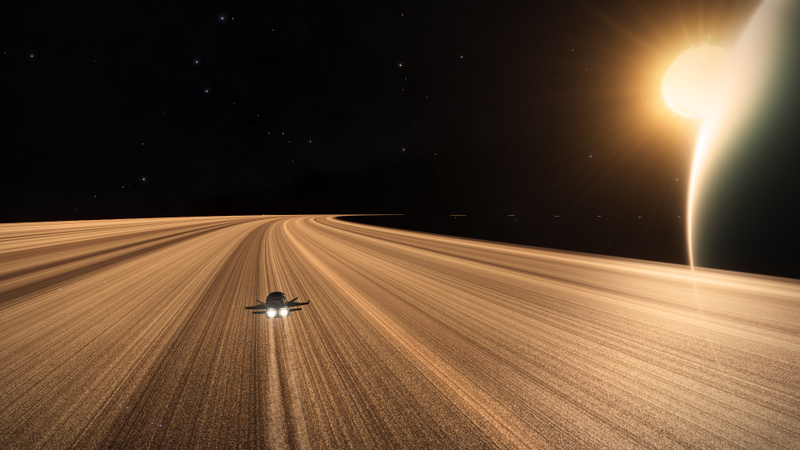 Do the usual supercruise and glide in. Don't glide too steep or you might take too long to level out. About 20° down is good. As soon as the glide ends, pull up, level out, zero the throttle, and deploy landing gear. From now on, keep your ship level at all times. Turn by yawing only, don't roll or pitch up or down. Land by tapping the Flight Assist button. Keep the taps as short as possible. Each tap will increase your vertical speed down. Try to keep it to 10-20 to start, slowing down as you get closer to the surface. Eventually you'll reach the altitude where the radar indicates a good landing spot. Use the throttle to go backwards and forwards and yaw to turn to find a spot. Stay level! When you've found a spot, tap Flight Assist until you land. Taking off is a bit more simple. Just use the vertical thrust up control. You will continue hold the thrust up full up until just before you activate supercruise. If the gravity is high it might take a while to actually lift off - you will get there eventually. Once you're clear of the surface, go full forward throttle while keeping vertical up thrust full on. Stay level! Once you reach maximum velocity, pull the ship up to vertical 80-90° then release the vertical up thrust. On a high-G world your ship will slow right down, maybe even start going backwards! Don't panic - stay vertical, hit boost if you like. Your ship will start going fowards and up again. Wait until you reach maximum velocity, by which time you will have left mass lock and then supercruise away.